We’ve put together this page to give Families and Carers some helpful resources that they may find useful with their child or young person at home. 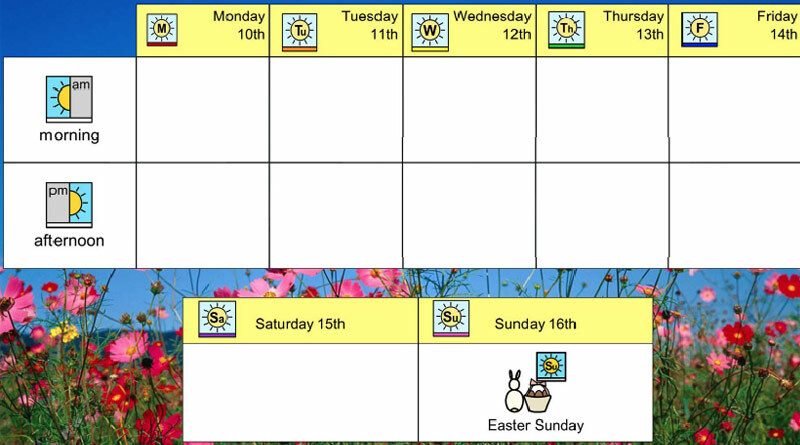 A downloadable 4-page PDF wallchart highlighting the Easter Holiday in 2017 and the proceeding/subsequent week. Each day is split down into Morning and Afternoon boxes so the day can be planned in advance, which may help reduce anxiety amongst some of our students. To load a copy, click on the image below. We all know Christmas can be a stressful time of year, especially for those families who have children with additional needs. With that in mind, and coming off the success of last year’s original, our advocacy champion has created this helpful video to guide you through all the elements of the 2016 toolkit. Need another copy of the Toolkit? Just click here! Within this video are hints, tips and notes which you may find useful to use in the run-up to Christmas and throughout the celebrations.